Ultrasonic Sensors offer multiplex and synchronized abilities for multiple sensors. Sensing ranges to 6 m and rectangular housings are available in 12 mm, 18 mm, and 30 mm diameters. Discrete or analog outputs and special models for sheet, splice and label detection technologies apply. Ultrasonic sensors are a ceramic piezo elements that carry an acoustic transmitter and receiver. Patented coupling layers made of special materials, which are used to connect the ultrasound to the acoustically thinner medium air. The ultrasonic frequency lies between 65 and 400Khz, depending on the sensor type. The VariKont Series offers a large design that has a power and output status LEDs for 360 visibility allowing bases to be compatible with previous models. The design is 55x55 mm, with 40 mm switching distance, and is available in 3 or 4 wire versions. The VariKont Series offers maximum functionality and user benefits. The F12 Series sensor features a durable die-cast zinc frame that’s virtually indestructible and highly adaptable. Product models are available with potentiometer or with pushbutton programming, adjustable beam width settings, temperature compensations, and a 4-20 mA, 0-20 mA, 0-10 V, or a flexible 4- in-1 output configuration. The F12 Series sensor is for a wide variety of markets and applications. The F42 Series sensors is rectangular in shape and is available with sensing ranges from 400 mm to 5 m. This versatile series can be powered by AC or DC supplies and has a relay contact output. Top or side-sensing models are offered for different mounting configurations. 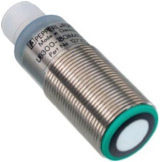 Capacitive Proximity Sensors are available in cylindrical, limit switch, flat pack and surface mount styles with AC or DC supplies. These sensors provide sensing ranges from 1mm to 50 mm with some models having potentiometers. These components are used to detect non-metallic objects, including liquids, acids, water, oil, granular materials, flour and sugar. This product is an ultimate combination of accuracy , durability and cost-effectiveness. This component is offered in a variety of housing styles, which feature different connection and mounting options. 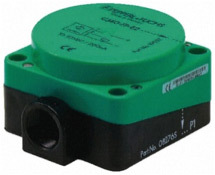 The Basic Series sensor is available in 2-,3-, and 4-wire DC and 2-wire AC styles.